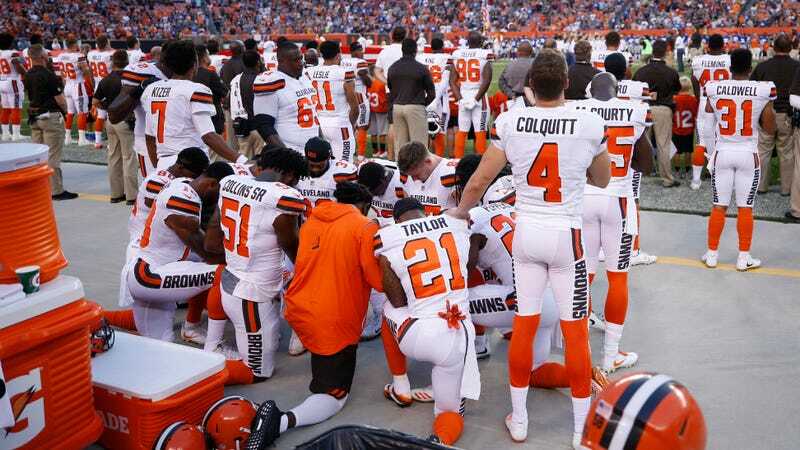 Cleveland’s police union will refuse to participate in the raising of the flag during the national anthem ceremony at the Browns home opener, to protest Browns players kneeling during the national anthem. The players not standing for the national anthem is offensive because of the sacrifices that people make that allows these guys to enjoy the success that they have, Loomis said. While they’re benefiting from protection of the flag they are kneeling in disrespect of it, he said. The Browns management and ownership condoned this disrespectful activity of their employees, Loomis said. So the Cleveland Police Patrolmen’s Association will demonstrate their frustration by refusing to participate in the team’s national anthem ceremony during Cleveland’s home opener on September 10.